Cleveland Clinic’s Universal Sisters Event! Cleveland Clinic Universal Sisters Keynote Speaker SusieQ FitLife! The Cleveland Clinic celebrated their 8th annual Universal Sisters: Live Younger Longer event, hosted by Dr. Linda D. Bradley in Cleveland, Ohio. The event Keynote Speaker was National Celebrity Fitness Trainer SusieQ who has been on numerous national television shows! It was an Oprah moment experience as SusieQ FitLife addressed hundreds of women and a few good men, as she delivered a meritorious presentation. 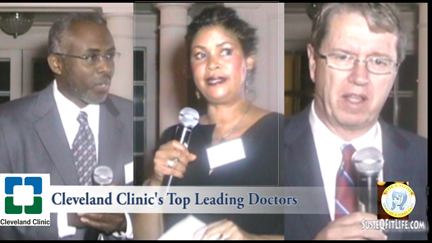 Top leading Cleveland Clinic Physicians, along with a robust group of panelists, who are health & wellness experts helped many women to enhance their lives through healthy eating, exercise, health screenings, assessments and colon health. 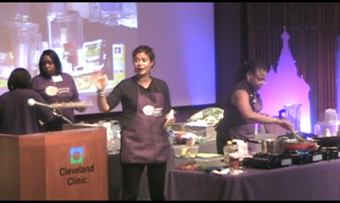 Practical tools were provided along with an incredible special cooking segment “What’s Food Got To Do With It?” demonstrated by Linda Bradley, MD & Margaret McKenzie, MD. Discover how to make healthful soul food from scratch that is in season. Unfortunately home cooking has become nonexistent. When it comes to feeding your body and mind, nothing is superior to preparing your food, (not from a box), with quality ingredients served with love. These techniques will help you save time & money as you learn how to modify recipes, making fresh, balanced meals that support weight loss, while promoting good health. You’ll enjoy rediscovering your kitchen and your taste buds! Reducing stress and avoiding sabotaging efforts to achieve optimal health was a key component! The event helps to raise awareness on women’s health issues, promoting self care and providing model behaviors to bring sustainable changes within the African-American community. This experience creates a “domino effect” that naturally occurs for women to strive for better health. Become inspired and energized just watching this highlight video clip, as you will gain a wealth of knowledge and motivation! The gift of Michelle Obama’s “Arms of a First Lady” DVD workout was included in all attendees gift bags! They were loaded with great sponsored products to help every woman on her journey to Living Younger Longer. Be sure to spread the word among your family, friends, and workplace community. Have a fun filled holiday & Happy New Year to ALL! Cleveland Clinic's Universal Sisters Experience! Thank you SusieQ. Such an inspiring event and wonderful message! During the next week many “New Year’s Resolutions” will be made. Many will be to get healthier. What a motivation to help us keep those resolutions. Excellent video!!! Lady Gaga Leg Workout, SusieQ & POSH the Prince!